This is a short breeding update by my friend Kay the Guru on Odontolabis dalmanni intermedia. I think it is really interesting for several reasons. First of all, Japanese breeders are already quite advanced when it comes to substrates and more and more started looking into temperature effects when trying to achieve maximum size Lucanidae. I think there is a lot for us european breeders to learn in the trials and efforts. Who knows, maybe one day one of us will provide the world-record size specimen for the Be-Kuwa championship. 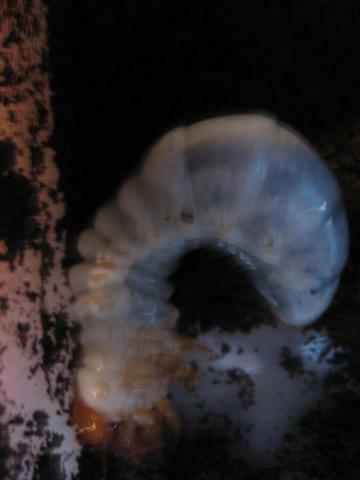 I have just changed substrate for my Odontolabis dalmanni intermedia larvae. I have five of them being kept in a wine cooler at around 18 degrees Celsius. Two, kept singly in a 1.5-liter plastic bottle, are still L2, but the other three are already L3 and have grown well. The one (male) shown in the photo is the biggest among them, which is being kept singly in a 12-liter plastic container. I tried to scale him but my digital scale’s batteries had run out. It probably weighs 30-40 grams. Here is their background: I bought a pair of wild-caught adults from Negros Is., Philippines at Mushi-sha, an insect shop in Tokyo, in June, 2012. I bred them in a 10-liter container and obtained about 50 larvae in September. First, I kept the larvae singly in a 120-milliliter plastic cup in a wine cooler at around 18 degrees Celsius for a month, and then I chose only five of them to rear myself and gave the rest to a friend of mine who has a large rearing facility. On October 31, 2012 I transferred them singly to a larger rearing container. Then, today I changed substrate. I will change substrate three months later. A finding: I have kept one larva of Hexathrius mandibularis sumatranus in the same wine cooler. It hatched in August 2012 and is still L2. So, 18 degrees Celsius may be too cold for it to grow. I have no problem with Odontolabis dalmanni intermedia and the other beetle larvae, Lucanus maculifemoratus maculifemoratus, in the same cooler. Thanks for posting a part of my beetle diaries. A friend of mine keeps some forty Odi larvae, which I gave away, in his large rearing facility – a company’s computer room, indeed! The room temperature is kept at 23 degrees Celcius all through the year. He has good skills to grow large stag beetles. Meanwhile, I have only five Odi larvae kept at 18 degrees Celcius. Number counts but I hope that my big one will grow over 100 mmm. It may take one more year, though.. I will keep you posted for any interesting findings. thanks for the additional information. I would be thankful if you can update us on this blog about your progress. While I am aware that low temperatures increase the time to beetle, they do help in attaining large size. I am wishing you good luck for achieving the 100+ mm Odontolabis dalmanni intermedia. I will keep you updated for my progress in rearing Odi. Also, I will contact my friend from time to time to check how his Odi larvae are. It is interesting to find out how different temperatures (18 vs. 23 degrees Celsius) affect the larval growth, despite the fact that we use different feeding substrate and different-sized rearing containers. To me, it is very interesting, as I did not see much work done on temperature effects on the size of the beetles. I noticed that really warm temperatures often result in dwarfs, but that is just a personal experience. In so far, your report is really interesting for me.